Grey days make me feel like making soup & baking. On Saturday I attempted florentines & ended up with one giant florentine. Boy do those little biscuits spread! Batch 4 & I still didn’t quite have it right! Not quite the perfect little rounds drizzled with chocolate that I was going for, though they did taste delicious & what are crunchy, nutty, toffee florentine like shards will make the perfect topping for some ice cream, which I am happy to indulge in all year round. Sunday’s baking adventures proved a little more successful. Flicking through the latest issue of Donna Hay Magazine this cake was what caught my attention. It was also a good way to use up some of these little beauties given to me by a friend at work. Along with lime there were pistachio & almonds in lieu of flour & a good drizzle of honey. So this would also be the perfect cake for any gluten free people out there. A zesty, nutty cake that almost sounds like it is good for you with fruit, nuts & honey all present. My only tweak a little more lime. *If you can’t find nut meal just buy the nuts & blitz them in a food processor. Pre heat oven to 160C / 325F. Lightly grease & line a 29cm x 7cm x 8cm loaf tin with baking paper. Place the butter, sugar, lime zest & vanilla in the bowl of an electric mixer & beat until pale & creamy, 10-12 minutes. Scrape down the sides of the bowl & add the eggs one at a time, beat for a moment after you add each one. Beat for 3-4 minutes more until well combined & then fold through the almond meal & pistachio meal until all mixed together. Spoon the mixture in to the loaf tin & smooth the top with a palette knife. Pop in the oven & bake for 1 hour - 1 hour 10 minutes or until a skewer comes out almost clean with just a few crumbs attached. Allow the cake to cool completely in the tin & then gently remove. To serve drizzle with honey. Zesty, nutty & quite delicious with a cuppa. 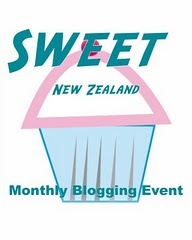 This is also my entry for this month's Sweet New Zealand being hosted by Bridget over at After Taste. I've been wondering what to do with the big bag of limes I bought at the market on Sunday... and now I know. Thanks for the inspiration. :) Good to hear...I'll also be passing on to my Dad...looks like possibly celiac or at the very least very gluten intolerant. If that's the case there will be a few more gluten free treats here soon! What a lovely cake, Mairi! I am such a fan of Donna Hay and I appreciate that this one is gluten-free. The combination of almonds, pistachios and lime sounds just wonderful. Thanks Hannah, I love Donna Hay, just wonderful simple delicious recipes. And then there are the photos. Love her styling. Oh yes! Lime and pistachio sounds like a great combination and I love loaves. Thanks Lesley, this one was pretty good. Love all the nuts & the lime for a little freshness.